The approach in the execution is a bit different from the previous samples. 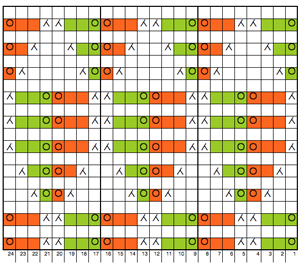 In this instance, colored squares represent number of stitches to be moved/ number of prongs on transfer tool to be used; the pairs of transfers are made away from each other, orange to the right, green to the left. The transfers produce 2 empty needles side by side; they are left in work, as the next row is knit they will produce loops on each needle. 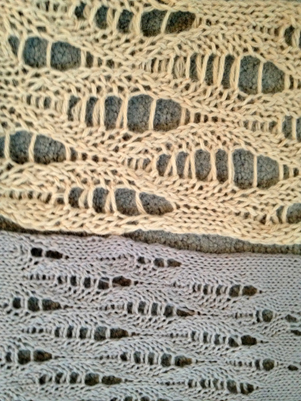 Side by side loops do not make stitches, so subsequent rows will continue the ladder. It is helpful to use yarn that does not split and get caught in hooks, as that may partially knit on the next pass. 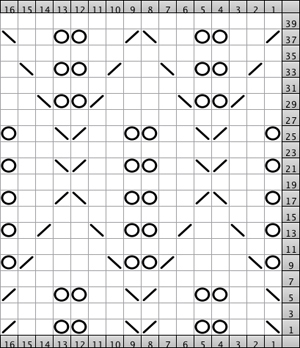 Also, rows with loops should be checked to make certain they are in the hooks, not off, before the next row of knitting. 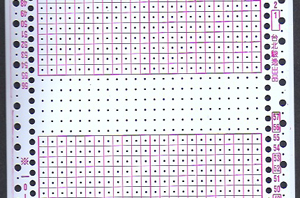 Do not release the loops; on the next set of transfers, treat the loop (where circles occur in graph) as you would a stitch, moving it over on its own prong. 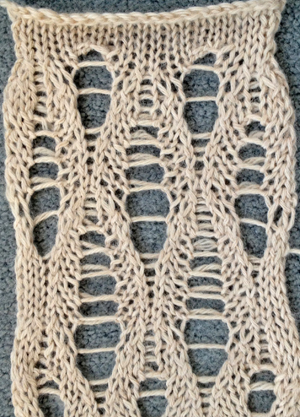 As with transfer lace, it bears taking the time to knit slowly and prevent errors rather than having to attempt “fixing” large runs due to dropped stitches. The yarn is an alpaca too thick for the standard. I liked at tension 1 for stocking stitch, but I had to increase the tension to 3.. to be able to manage the transfers, especially the ones over by 3 stitches X2. 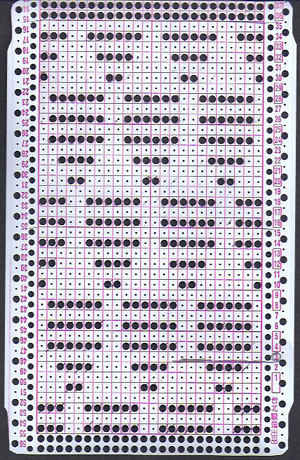 The punchcard was made from a roll purchased directly from Hong Kong, advertised specifically for Brother. 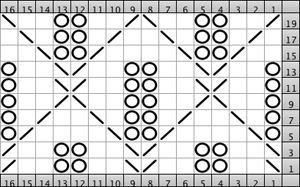 The roll is continuous, with separations as seen in the image below. Numbering however is for Studio KM systems, so adjustments need to be made for using them on Brother KMs (ie. 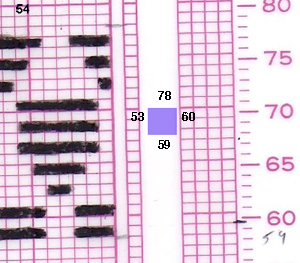 first selection row will be row 3 as marked in punchcard used in swatch above).